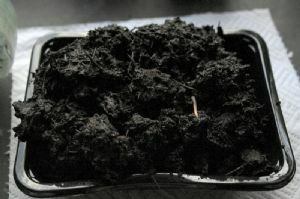 - The organic gardener's black gold! This is a completely natural product that will boost the growth and production of your vegetables and flowers. Worm Cast fertiliser is organically produced by worms digesting organic kitchen and garden waste in our own wormery for at least 6 months. It is completely organic and vegan and is the perfect medium to sprinkle into seed drills before sowing seed, add to your own favourite compost mix or top-up pot plants, Crumbly and nutrient-rich, it's ideal for young plants because it won't harm their roots. Sold in small quantities of 500grams 100% worm cast fertiliser. Sprinkle sparingly as a soil conditioner/feed.